As global and powerful as a business brand may be it cannot compete with the power of a religious brand. It may be tacky to use the word “religion” in the same sentence as “brand” but let’s not be naive. Most religions throughout history have some link to the financial World if not a very big and powerful one. Religions are brands. They represent values, guidelines and regulations on how you should lead your life according to the company director….the big man upstairs (or woman). Each religion has their managing directors (popes, gurus, priests, Brahmans) which lead and make decisions on what and how the brand should change. Each religion has their corporate manual in the form of religious books…..The Bible, Baghvahad Gita, The Quran etc. Each religion has their brand spokes person in the form of saints. Lastly each religion has its own religious logo design which are possibly the greatest logo designs of all time. Universally recognized they rule the World holding more power than any business. Here are some of my favourite religious logo designs, albeit pretty obvious ones. 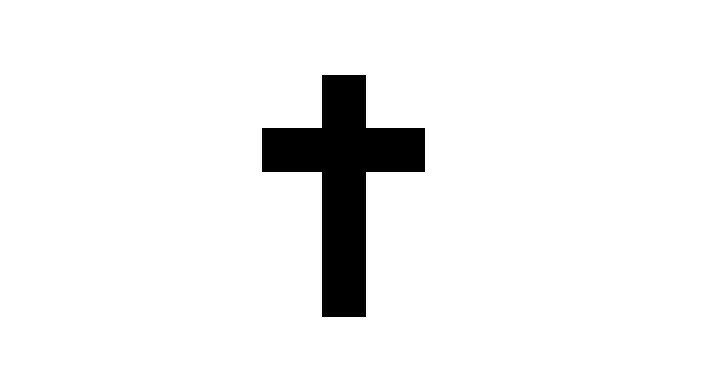 Maybe an obvious choice but how many have actually thought about the Christian Cross in terms of graphic design. It’s not the most creative logo design but its simplicity sums up a great story of Jesus and his last days with just two lines. The icon’s design has an instant connotation to Jesus showing great symbolism and probably one of the most famous icons of our time. 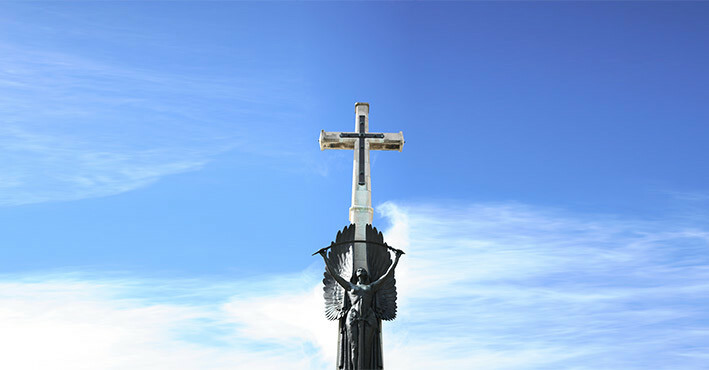 All of the complexity, history and geritage make for greeat religious branding. In short, it’s a brilliant icon, symbolising the climatic ending chapter of the story which Christianity is built upon. In this case the power of the logo lies upon the branding behind it. Clearly a creative logo with swooping curves and hand drawn typographic style to produce a unique appearance. It’s the oldest logo of the three and comes in many variations but all are recognizable as one icon. Spawning from the Hindu religion and the Sanskrit text it’s like most Hindu Symbols, an interpretation. It represents God, the truth, the universe, the ultimate sound (aum) and in some sense it represents everything, therefore it cannot be defined. Each section of the logo has a meaning so it’s a highly functional and communicative like a hieroglyphic (it’s more then a symbol, it’s a set of words). Visually, it’s incredibly artistic and a pleasure to draw. With so many curves and swooshes it literally gives your hand freedom on the paper. 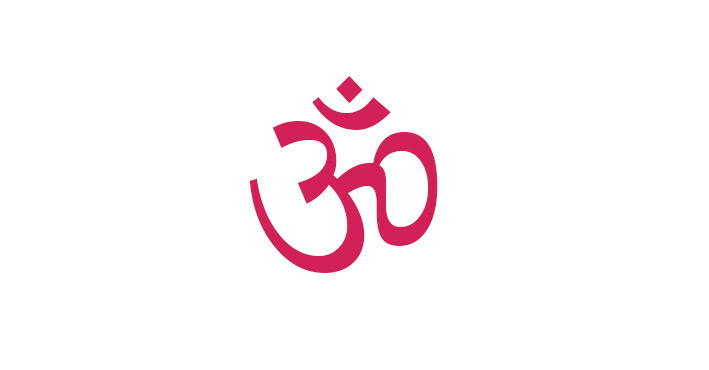 What’s more, like its definition the design is open to interpretation so when you draw it you can get carried away and come out with something different yet it’ll still be an aum symbol. The origin of the symbol is in the Sanksrit text which dates back to 1500 BCE. How it came to be? I don’t know but its appearance and meaning is highly unique, attractive and complex as well as a timeless classic making it a universal favourite. I think its pretty safe to say that the Yin Yang is the graphic designers favourite. Composed with a dissected circle, two colours, two inner circles and a swooshy line, it has graphic design written all over it. It represents all opposite forces which are perceived as independent being interconnected and dependant on each other in the natural world. The Ying Yang symbol unlike others religious logos is not seen as a force but actually as a theory with a concise description of its characteristics. 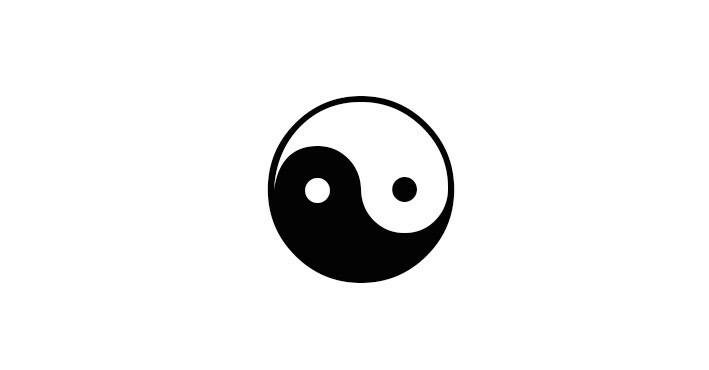 Yin Yang are opposing: light dark, male female, summer and winter. Yin yang are rooted together: Despite being opposites they rely on each other to exist and survive. Yin yang transform each other: One provides an action whilst the other provides the reaction. Yin-yang are balanced: They rise and fall together. The Yin Yang is a common but personal favourite design not only due to it’s theoretical meaning but its style. Rarely is a religious logo design so contemporary, gothic and still cool! It just goes to prove that sometimes the simple ideas are the best and they can even include a little beauty in aesthetic lines as well.